You understand how to configure and manage a CDB. See Managing a Multitenant Environment for information. You understand how to use Oracle Resource Manager to allocate resources in a non-CDB. See Managing Resources with Oracle Database Resource Manager for information. You can also administer the Resource Manager with the graphical user interface of Oracle Enterprise Manager Cloud Control (Cloud Control). For instructions about administering Resource Manager in a CDB with Cloud Control, see Using Oracle Resource Manager for PDBs with Cloud Control and the Cloud Control online help. You can create CDB resource plans and PDB resource plans to manage resources for CDBs and PDBs. CDB level - Resource Manager can manage the workloads for multiple PDBs that are contending for system and CDB resources. You can specify how resources are allocated to PDBs, and you can limit the resource utilization of specific PDBs. PDB level - Resource Manager can manage the workloads within each PDB. It allocates a portion of the system's resources to each PDB. In a specific PDB, it allocates a portion of system resources obtained in Step 1 to each session connected to the PDB. All activity in the root is automatically managed by Resource Manager. Resource Manager can provide more efficient use of resources for a CDB. The operating system distributes resources equally among all active processes and cannot prioritize one task over another. Therefore, one or more PDBs might use an inordinate amount of the system resources, leaving the other PDBs starved for resources. One or more sessions connected to a single PDB might use an inordinate amount of the system resources, leaving other sessions connected to the same PDB starved for resources. A single PDB might perform inconsistently when other PDBs are competing for more system resources or less system resources at various times. Resource usage data is critical for monitoring and tuning PDBs. It might be possible to use operating system monitoring tools to gather the resource usage data for a non-CDB if it is the only database running on the system. However, in a CDB, operating system monitoring tools are no longer as useful because there are multiple PDBs running on the system. Resource Manager helps to overcome these problems by allowing the CDB more control over how hardware resources are allocated among the PDBs and within PDBs. In a CDB with multiple PDBs, some PDBs typically are more important than others. The Resource Manager enables you to prioritize and limit the resource usage of specific PDBs. In a CDB, PDBs might have different levels of priority. You can create CDB resource plans to distribute resources to different PDBs based on these priorities. A CDB resource plan allocates resources to its PDBs according to its set of resource plan directives (directives). There is a parent-child relationship between a CDB resource plan and its directives. Each directive references one PDB, and no two directives for the currently active plan can reference the same PDB. A directive can control the allocation of resources to PDBs based on the share value that you specify for each PDB. A higher share value for a PDB results in more resources for that PDB. For example, you can specify that one PDB is allocated double the resources allocated to a second PDB by setting the share value for the first PDB twice as high as the share value for the second PDB. You can also specify utilization limits for PDBs. The utilization limit for a PDB limits resource allocation to the PDB. For example, it can control how much CPU the PDB gets as a percentage of the total CPU available to the CDB. You can use both shares and utilization limits together for precise control over the resources allocated to each PDB in a CDB. The following sections provide more information about shares and utilization limits. To allocate resources among PDBs, you assign a share value to each PDB. A higher share value results in more guaranteed resources for a PDB. You specify a share value for a PDB using the CREATE_CDB_PLAN_DIRECTIVE procedure in the DBMS_RESOURCE_MANAGER package. The shares parameter in this procedure specifies the share value for the PDB. Figure 44-1 shows an example of three PDBs with share values specified for them in a CDB resource plan. Description of "Figure 44-1 Shares in a CDB Resource Plan"
Figure 44-1 shows that the total number of shares is seven (3+3+1). The salespdb and the servicespdb PDB are each guaranteed 3/7th of the resources, while the hrpdb PDB is guaranteed 1/7th of the resources. However, any PDB can use more than the guaranteed amount of a resource if there is no resource contention. Table 44-1 shows the resources allocation to the PDBs in Figure 44-1 based on the share values, assuming that loads of the PDBs consume all of the system resources allocated. The salespdb and servicespdb PDBs can consume the same amount of CPU resources. The salespdb and servicespdb PDBs are each guaranteed three times more CPU resource than the hrpdb PDB. See "CPU" for more information about this resource. Queued parallel queries from the salespdb and servicespdb PDBs are selected equally. Queued parallel queries from the salespdb and servicespdb PDBs are selected three times as often as queued parallel queries from the hrpdb PDB. See "Degree of Parallelism Limit" for more information about this resource. A utilization limit restrains the system resource usage of a specific PDB. You can specify utilization limits for CPU and parallel execution servers. Table 44-2 describes utilization limits for PDBs and the Resource Manager action taken when a PDB reaches a utilization limit. The sessions connected to a PDB reach the CPU utilization limit for the PDB. This utilization limit for CPU is set by the utilization_limit parameter in the CREATE_CDB_PLAN_DIRECTIVE procedure of the DBMS_RESOURCE_MANAGER package. The utilization_limit parameter specifies the percentage of the system resources that a PDB can use. The value ranges from 0 to 100. Resource Manager throttles the PDB sessions so that the CPU utilization for the PDB does not exceed the utilization limit. A PDB uses more than the value of the PARALLEL_SERVERS_TARGET initialization parameter multiplied by the value of the parallel_server_limit parameter in the CREATE_CDB_PLAN_DIRECTIVE procedure. For example, if the PARALLEL_SERVERS_TARGET initialization parameter is set to 200 and the parallel_server_limit parameter for a PDB is set to 10%, then utilization limit for the PDB is 20 parallel execution servers (200 X .10). Resource Manager queues parallel queries if the number of parallel execution servers used by the PDB would exceed the limit specified by the PARALLEL_SERVERS_TARGET initialization parameter value multiplied by the value of the parallel_server_limit parameter in the CREATE_CDB_PLAN_DIRECTIVE procedure. Figure 44-2 shows an example of three PDBs with shares and utilization limits specified for them in a CDB resource plan. Description of "Figure 44-2 Shares and Utilization Limits in a CDB Resource Plan"
Figure 44-2 shows that there are no utilization limits on the salespdb and servicespdb PDBs because utilization_limit and parallel_server_limit are both set to 100% for them. However, the hrpdb PDB is limited to 70% of the applicable system resources because utilization_limit and parallel_server_limit are both set to 70%. When you do not explicitly define directives for a PDB, the PDB uses the default directive for PDBs. Table 44-3 shows the attributes of the initial default directive for PDBs. When a PDB is plugged into a CDB and no directive is defined for it, the PDB uses the default directive for PDBs. You can create new directives for the new PDB. You can also change the default directive attribute values for PDBs by using the UPDATE_CDB_DEFAULT_DIRECTIVE procedure in the DBMS_RESOURCE_MANAGER package. When a PDB is unplugged from a CDB, the directive for the PDB is retained. If the same PDB is plugged back into the CDB, then it uses the directive defined for it if the directive was not deleted manually. Figure 44-3 shows an example of the default directive in a CDB resource plan. Description of "Figure 44-3 Default Directive in a CDB Resource Plan"
Figure 44-3 shows that the default PDB directive specifies that the share is 1, the utilization_limit is 50%, and the parallel_server_limit is 50%. Any PDB that is part of the CDB and does not have directives defined for it uses the default PDB directive. Figure 44-3 shows the PDBs marketingpdb and testingpdb using the default PDB directive. Therefore, marketingpdb and testingpdb each get 1 share and a utilization limit of 50. "Creating New CDB Resource Plan Directives for a PDB"
"Updating the Default Directive for PDBs in a CDB Resource Plan"
A CDB resource plan determines the amount of resources allocated to each PDB. A PDB resource plan determines how the resources allocated to a specific PDB are allocated to consumer groups within that PDB. A PDB resource plan is similar to a resource plan for a non-CDB. Specifically, a PDB resource plan allocates resource among the consumer groups within a PDB. You can use a PDB resource plan to allocate the resources described in "The Types of Resources Managed by the Resource Manager". When you create one or more PDB resource plans, the CDB resource plan for the PDB's CDB should meet certain requirements. Table 44-4 describes the requirements for the CDB resource plan and the results when the requirements are not met. You create directives for a CDB resource plan by using the CREATE_CDB_PLAN_DIRECTIVE procedure in the DBMS_RESOURCE_MANAGER package. You create directives for a PDB resource plan using the CREATE_PLAN_DIRECTIVE procedure in the same package. When you create one or more PDB resource plans and there is no CDB resource plan, the CDB uses the DEFAULT_CDB_PLAN that is supplied with Oracle Database. Table 44-4 describes parameter values for PL/SQL procedures. The parameter values described in the "CDB Resource Plan Requirements" column are for the CREATE_CDB_PLAN_DIRECTIVE procedure. The parameter values described in the "Results When Requirements Are Not Met" column are for the CREATE_PLAN_DIRECTIVE procedure. A share value must be specified for the PDB using the shares parameter. A utilization limit for CPU below 100 must be specified for the PDB using the utilization_limit parameter. These values can be set in a directive for the specific PDB or in a default directive. The CPU allocation policy of the PDB resource plan is not enforced. The CPU limit specified by the utilization_limit parameter in the PDB resource plan is not enforced. A parallel server limit below 100 must be specified for the PDB using the parallel_server_limit parameter. 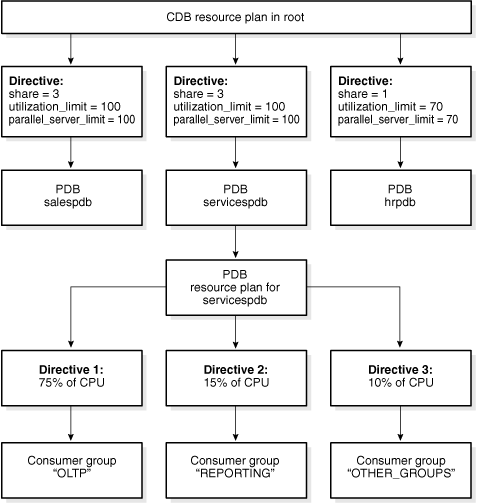 The parallel execution server allocation policy of the PDB resource plan is not enforced. The parallel server limit specified by the parallel_server_limit parameter in the PDB resource plan is not enforced. Figure 44-4 shows an example of a CDB resource plan and a PDB resource plan. Description of "Figure 44-4 A CDB Resource Plan and a PDB Resource Plan"
Figure 44-4 shows some of the directives in a PDB resource plan for the servicespdb PDB. Other PDBs in the CDB can also have PDB resource plans. If you create a PDB using a non-CDB, and the non-CDB contains resource plans, then these resource plans might not conform to these restrictions. In this case, Oracle Database automatically transforms these resource plans into equivalent PDB resource plans that meet these requirements. The original resource plans and directives are recorded in the DBA_RSRC_PLANS and DBA_RSRC_PLAN_DIRECTIVES views with the LEGACY status. "Creating a PDB Using a Non-CDB"
In a CDB, background and administrative tasks are mapped to the Resource Manager consumer groups that run them optimally. A task is mapped to a consumer group in the container that starts the task. If a task starts in the root, then the task is mapped to a consumer group in the root. If the task starts in a PDB, then the task is mapped to a consumer group in the PDB. When a task is started by an internal client using an internal API, the internal API determines the consumer group to which the task is mapped. For example, a backup task uses an internal Oracle function. When SYS starts a backup task in the root, the backup task is mapped based on the Oracle function to the SYS_GROUP consumer group in the root. When a task is started without using an internal API, the task is mapped to a consumer group based on the user-defined mapping rules. For example, when SYS is mapped to the SYS_GROUP consumer group, a task started by SYS is mapped to the SYS_GROUP consumer group. You must meet prerequisites before using Resource Manager with a CDB. The CDB must exist and must contain PDBs. See Creating and Configuring a CDB and Creating and Removing PDBs with SQL*Plus. To complete a task that uses the DBMS_RESOURCE_MANAGER package, a user must have ADMINISTER_RESOURCE_MANAGER system privilege. See "About Resource Manager Administration Privileges". You use the DBMS_RESOURCE_MANAGER package to create a CDB resource plan and define the directives for the plan. Create the pending area using the CREATE_PENDING_AREA procedure. Create the CDB resource plan using the CREATE_CDB_PLAN procedure. Create directives for the PDBs using the CREATE_CDB_PLAN_DIRECTIVE procedure. (Optional) Update the default PDB directive using the UPDATE_CDB_DEFAULT_DIRECTIVE procedure. (Optional) Update the default autotask directive using the UPDATE_CDB_AUTOTASK_DIRECTIVE procedure. Validate the pending area using the VALIDATE_PENDING_AREA procedure. Submit the pending area using the SUBMIT_PENDING_AREA procedure. A scenario illustrates each of the steps involved in creating a CDB resource plan. The scenario assumes that you want to create a CDB resource plan for a CDB named newcdb. The plan includes a directive for each PDB. In this scenario, you also update the default directive and the autotask directive. The directives are defined using various procedures in the DBMS_RESOURCE_MANAGER package. The attributes of each directive are defined using parameters in these procedures. Table 44-5 describes the types of directives in the plan. Resource allocation share for CPU and parallel execution server resources. See "Shares for Allocating Resources to PDBs". Resource utilization limit for CPU. See "Utilization Limits for PDBs". Maximum percentage of parallel execution servers that a PDB can use. When the parallel_server_limit directive is specified for a PDB, the limit is the value of the PARALLEL_SERVERS_TARGET initialization parameter multiplied by the value of the parallel_server_limit parameter in the CREATE_CDB_PLAN_DIRECTIVE procedure. See "Utilization Limits for PDBs". Table 44-6 describes how the CDB resource plan allocates resources to its PDBs using the directive attributes described in Table 44-5. The salespdb and servicespdb PDBs are more important than the other PDBs in the CDB. Therefore, they get a higher share (3), unlimited CPU utilization resource, and unlimited parallel execution server resource. The default directive applies to PDBs for which specific directives have not been defined. For this scenario, assume that the CDB has several PDBs that use the default directive. This scenario updates the default directive. In addition, this scenario updates the autotask directive. The autotask directive applies to automatic maintenance tasks that are run in the root maintenance window. Create the CDB resource plan directives for the PDBs using the CREATE_CDB_PLAN_DIRECTIVE procedure. Each directive specifies how resources are allocated to a specific PDB. All other PDBs in this CDB use the default PDB directive. If the current default CDB resource plan directive for PDBs does not meet your requirements, then update the directive using the UPDATE_CDB_DEFAULT_DIRECTIVE procedure. The default directive applies to PDBs for which specific directives have not been defined. See "The Default Directive for PDBs" for more information. If the current autotask CDB resource plan directive does not meet your requirements, then update the directive using the UPDATE_CDB_AUTOTASK_DIRECTIVE procedure. The autotask directive applies to automatic maintenance tasks that are run in the root maintenance window. A CDB resource plan manages the workloads for multiple PDBs that are contending for system and CDB resources. You can enable or disable a CDB resource plan. You enable the Resource Manager for a CDB by setting the RESOURCE_MANAGER_PLAN initialization parameter in the root. This parameter specifies the top plan, which is the plan to be used for the current CDB instance. If no plan is specified with this parameter, then the Resource Manager is not enabled. Before enabling a CDB resource plan, complete the prerequisites described in "Prerequisites for Using Resource Manager with a CDB". Use an ALTER SYSTEM statement to set the RESOURCE_MANAGER_PLAN initialization parameter to the CDB resource plan. In a text initialization parameter file, set the RESOURCE_MANAGER_PLAN initialization parameter to the CDB resource plan, and restart the CDB. You can also schedule a CDB resource plan change with Oracle Scheduler. See "Enabling Oracle Database Resource Manager and Switching Plans" and Oracle Scheduler Concepts for more information. You disable the Resource Manager for a CDB by unsetting the RESOURCE_MANAGER_PLAN initialization parameter in the root. If you disable a CDB resource plan, then some directives in PDB resource plans become disabled. See "PDB Resource Plans" for information about the CDB resource plan requirements for PDB resource plans. Before disabling a CDB resource plan, complete the prerequisites described in "Prerequisites for Using Resource Manager with a CDB". Use an ALTER SYSTEM statement to unset the RESOURCE_MANAGER_PLAN initialization parameter for the CDB. In an initialization parameter file, unset the RESOURCE_MANAGER_PLAN initialization parameter, and restart the CDB. To shut down and restart a CDB, see "Shutting Down a CDB Instance" and "Starting Up a Database". You create a PDB resource plan in the same way that you create a resource plan for a non-CDB. You use procedures in the DBMS_RESOURCE_MANAGER PL/SQL package to create the plan. A CDB resource plan allocates a portion of the system's resources to a PDB. A PDB resource plan determines how this portion is allocated within the PDB. In SQL*Plus, ensure that the current container is a PDB. Create a pending area using the CREATE_PENDING_AREA procedure. Create, modify, or delete consumer groups using the CREATE_CONSUMER_GROUP procedure. Map sessions to consumer groups using the SET_CONSUMER_GROUP_MAPPING procedure. Create the PDB resource plan using the CREATE_PLAN procedure. Create PDB resource plan directives using the CREATE_PLAN_DIRECTIVE procedure. Ensure that the current container is a PDB and that the user has the required privileges when you complete these steps. See "Creating a Complex Resource Plan" for detailed information about completing these steps. You also have the option of creating a simple resource plan that is adequate for many situations using the CREATE_SIMPLE_PLAN procedure. See "Creating a Simple Resource Plan ". Some restrictions apply to PDB resource plans. See "PDB Resource Plans" for information. A PDB resource plan manages the workloads within a single PDB. You can enable or disable a PDB resource plan. You enable a PDB resource plan by setting the RESOURCE_MANAGER_PLAN initialization parameter to the plan with an ALTER SYSTEM statement when the current container is the PDB. If no plan is specified with this parameter, then no PDB resource plan is enabled for the PDB. Before enabling a PDB resource plan, complete the prerequisites described in "Prerequisites for Using Resource Manager with a CDB". Use an ALTER SYSTEM statement to set the RESOURCE_MANAGER_PLAN initialization parameter to the PDB resource plan. You can also schedule a PDB resource plan change with Oracle Scheduler. See "Enabling Oracle Database Resource Manager and Switching Plans" and Oracle Scheduler Concepts for more information. The following example sets the PDB resource plan to salespdb_plan. You disable a PDB resource plan by unsetting the RESOURCE_MANAGER_PLAN initialization parameter in the PDB. Before disabling a PDB resource plan, complete the prerequisites described in "Prerequisites for Using Resource Manager with a CDB". Use an ALTER SYSTEM statement to unset the RESOURCE_MANAGER_PLAN initialization parameter for the PDB. The following example disables the PDB resource plan. This section provides instructions for maintaining CDB resource plans, the default directive for PDBs, the autotask directive, and PDB resource plans. You perform maintenance tasks using the DBMS_RESOURCE_MANAGER PL/SQL package. Managing a CDB resource plan includes tasks such as updating the plan, creating, updating, or deleting plan directives for PDBs, and updating default directives. You can update a CDB resource plan to change its comment using the UPDATE_CDB_PLAN procedure. Before updating a CDB resource plan, complete the prerequisites described in "Prerequisites for Using Resource Manager with a CDB". Run the UPDATE_CDB_PLAN procedure, and enter a new comment in the new_comment parameter. When you create a PDB in a CDB, you can create a CDB resource plan directive for the PDB using the CREATE_CDB_PLAN_DIRECTIVE procedure. The directive specifies how resources are allocated to the new PDB. Before creating a new CDB resource plan directive for a PDB, complete the prerequisites described in "Prerequisites for Using Resource Manager with a CDB". Run the CREATE_CDB_PLAN_DIRECTIVE procedure, and specify the appropriate values for the new PDB. You can update the CDB resource plan directive for a PDB using the UPDATE_CDB_PLAN_DIRECTIVE procedure. The directive specifies how resources are allocated to the PDB. Before updating a CDB resource plan directive for a PDB, complete the prerequisites described in "Prerequisites for Using Resource Manager with a CDB". Run the UPDATE_CDB_PLAN_DIRECTIVE procedure, and specify the new resource allocation values for the PDB. You can delete the CDB resource plan directive for a PDB using the DELETE_CDB_PLAN_DIRECTIVE procedure. You might delete the directive for a PDB if you unplug or drop the PDB. However, you can retain the directive, and if the PDB is plugged into the CDB in the future, the existing directive applies to the PDB. Before deleting a CDB resource plan directive for a PDB, complete the prerequisites described in "Prerequisites for Using Resource Manager with a CDB". Run the DELETE_CDB_PLAN_DIRECTIVE procedure, and specify the CDB resource plan and the PDB. You can update the default directive for PDBs in a CDB resource plan using the UPDATE_CDB_DEFAULT_DIRECTIVE procedure. The default directive applies to PDBs for which specific directives have not been defined. See "The Default Directive for PDBs" for more information. Before updating the default directive for PDBs in a CDB resource plan, complete the prerequisites described in "Prerequisites for Using Resource Manager with a CDB". Run the UPDATE_CDB_DEFAULT_DIRECTIVE procedure, and specify the appropriate default resource allocation values. You can update the autotask directive in a CDB resource plan using the UPDATE_CDB_AUTOTASK_DIRECTIVE procedure. The autotask directive applies to automatic maintenance tasks that are run in the root maintenance window. Before updating the default directive for maintenance tasks in a CDB resource plan, complete the prerequisites described in "Prerequisites for Using Resource Manager with a CDB". Run the UPDATE_CDB_AUTOTASK_DIRECTIVE procedure, and specify the appropriate autotask resource allocation values. You can delete a CDB resource plan using the DELETE_CDB_PLAN procedure. The resource plan must be disabled. You might delete a CDB resource plan if the plan is no longer needed. You can enable a different CDB resource plan, or you can disable Resource Manager for the CDB. Before deleting a CDB resource plan, complete the prerequisites described in "Prerequisites for Using Resource Manager with a CDB". Run the DELETE_CDB_PLAN procedure, and specify the CDB resource plan. "Enabling a CDB Resource Plan"
"Disabling a CDB Resource Plan"
You can use the DBMS_RESOURCE_MANAGER package to modify a PDB resource plan in the same way you would modify the resource plan for a non-CDB. Before modifying a PDB resource plan, complete the prerequisites described in "Prerequisites for Using Resource Manager with a CDB". Update a consumer group using the UPDATE_CONSUMER_GROUP procedure. Delete a consumer group using the DELETE_CONSUMER_GROUP procedure. Update a resource plan using the UPDATE_PLAN procedure. Delete a resource plan using the DELETE_PLAN procedure. Update a resource plan directive using the UPDATE_PLAN_DIRECTIVE procedure. Delete a resource plan directive using the DELETE_PLAN_DIRECTIVE procedure. See "Maintaining Consumer Groups, Plans, and Directives" for instructions about completing these tasks. You can view information about CDB resource plans, CDB resource plan directives, and predefined resource plans in a CDB. "Monitoring Oracle Database Resource Manager"
An example illustrates using the DBA_CDB_RSRC_PLANS view to display all of the CDB resource plans defined in the CDB. The DEFAULT_CDB_PLAN is a default CDB plan that is supplied with Oracle Database. You can use this default plan if it meets your requirements. Plans in the pending area have a status of PENDING. Plans in the pending area are being edited. Any plan that is not in the pending area has a NULL status. 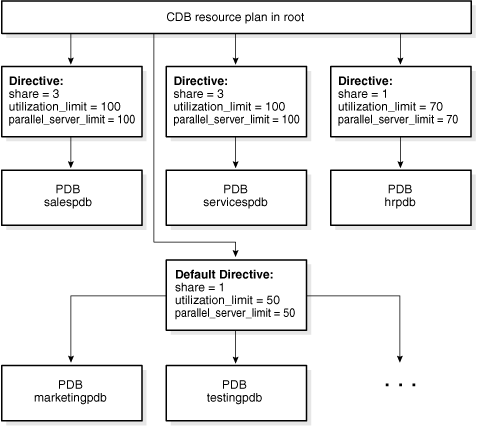 An example illustrates using the DBA_CDB_RSRC_PLAN_DIRECTIVES view to display all of the directives defined in all of the CDB resource plans in the CDB. This output shows the directives for the newcdb_plan created in "Creating a CDB Resource Plan: A Scenario" and modified in "Managing a CDB Resource Plan". The ORA$DEFAULT_PDB_DIRECTIVE is the default directive for PDBs. See "The Default Directive for PDBs".